Used to come here a lot about 20 yrs ago and considered it the best pub in Southampton. Then it went through a rough patch with frequent changes of landlord and poor beer quality so I stopped going. Now happy to report that it seems to be back on form and my excellent pint of Entire Stout was good value at £3.40. Back where it belongs as one of Soton's finest. The Waterloo Arms was the third stop of our Southampton crawl (the second stop, the Key & Anchor) is not listed on here). 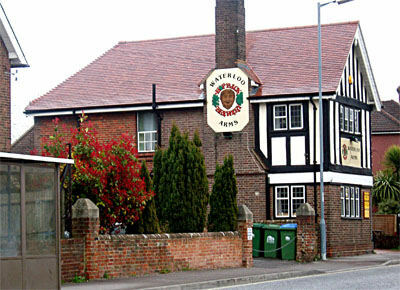 The Waterloo is a Hopback pub. This is possibly only the second Hopback pub I have visited, having previously been to the Sultan in London. This one felt similar in character. It's fairly cosy inside and many were enjoying Sunday lunches. The ale range was mostly Hopback - Crop Circle, Red Amber, Winter Lightning, Summer Lightning, Entire Stout & GFB. Other ales were Downton New Forest Ale, Daleside Stout & Oldershaw Old Boy. One of a few decent pubs in the area. New managers at this pub!